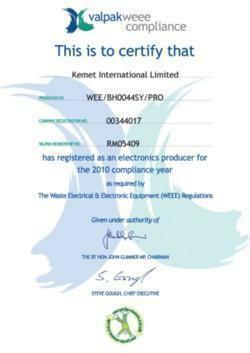 As a supplier of electrical handtools, Kemet is fully committed to WEEE legislation, more formally known as "Directive 2002/96/EC on the waste electrical and electronic equipment (WEEE)" which came into effect in the UK on 13 August 2005. This directive deals with the treatment, recovery and recycling of waste electrical and electronic equipment. All electrical handtools sold after this date are marked with a crossed out wheelie bin. Kemet will bulk up the goods are arrange collection and recycling by SITA , a recycling company approved by the Environment Agency. All electrical products sold by Kemet are supplied as RoHS compliant.